The website “The Art in You” (www.theartinyou.com) was created because I wanted to start a business and sell altered items and art N’ stuff! I started spending a lot of money along the way making a website and buying STUFF! Then I started to say to myself “what the heck am I doing and why?” I really couldn’t answer that question. My focus has changed so much in the last year. “The Art in You” is a play on words because you can take the “he” in THE and add to “Art” and get HEART. Get it…the heart in you or as I saw it you put your heart in art. Right now I’m not putting my HEART into my art I seem to think I need create a store, a business leaving no time for creativity. But WHY? What’s the point? We all like money but will it bring me more happiness? No! Do I need it to live? No, thank goodness. Will it frustrate me trying to figure out what to sell, what to buy? YES Can I compete with the big stores, blogs, and online sites? DO I want to compete with others? No….Hey! Maybe I need to re-think what I’m doing. Now I’m not rich by any means but I’m retired and getting by and try to enjoy each day. I have friends that give their time and money to charities and worthwhile causes. I volunteer to help and have done that throughout my lifetime and will continue to do that. Still I want to give but in a different way. 1. 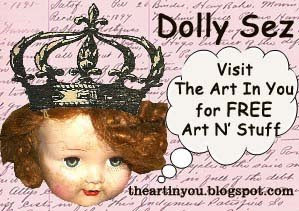 Use my blog http://www.theartinyou.blogspot.com to share Art N’ Stuff! 2. Each month I will have at least one project I will complete or have previously completed and willing to give to someone. Hopefully someone out there will want it tee hee If I meet a creative block or “life gets in the way” I might give away other things I have such as embellishments, books, scrapbook paper, vintage STUFF….hopefully it will be of value to someone. 3. I will post pictures and give it away. People can add a comment to each item they would like to be in the drawing for (one post per item please) and sometime during the month I’ll draw a number (thru a random number generator) and pick a winner and I will mail that month’s art or supplies to the winner. NO you will not even have to pay shipping, I’ll pay it. YES, I will ship internationally too. 6. No strings………there is nothing to buy, nothing to fill out, nothing sign up for. I hate it when something says FREE but means I have to jump thru hoops to get it and usually end up frustrated. 1. When I list the monthly project(s) to be given away. Write a comment. Like “I want it” or “Are you crazy, I live in Iceland?” or “I don’t really want it but it’s free” or whatever “nice” message you would like to leave as a comment. Don’t forget to give me a way to contact you. 2. Some months I intend to give away more than one piece of Art N’ STUFF. Some altered art, vintage items or Scrapbooking items. So on those months, I will have separate postings. Leave a comment only on the ones you want to get a chance to win. 3. If you feel like it, pass the word on about FREE Art N’ STUFF by blogging about it. Grab my logo “Dolly Sezs” with my link and post it on your blog, email it to friends, etc. so others can come and get Art n’ Stuff for FREE. 4. Let me know you posted my image and link on your blog or website and I will put a reciprocal link to your website on my site. 5. Do you have something to give away for FREE (I mean Free, no strings please)? Let me know and I’ll blog about it. Now I’m not completely CRAZY or willing to Give It all away so from time to time I will post something for sale on this blog or on my Etsy site. If you feel like buying something to support my “postage budget” or like what you see, buy it!! No pressure….. remember, from now on I am working for YOU and my creative spirit. I already feel lighter and have a greater sense of urgency to Create. Yay! Have a great month. Check back in on June 1 to see what my first giveawayS are. Happy Memorial Day. 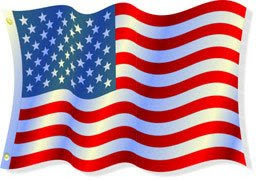 I hope you all have a wonderful day and remember those that have and do help to keep our country free. Make a Birthday Wish and Blow!!!! Maryam and Melanie planned the party. Leave it to Maryam, to bring tables and chairs and have little party favors. Everything was PERFECT and I am pretty sure Gloria was touched to have all her friends and family come to celebrate. I know I had a fun. You just can't help being happy and inspired when a great group of women get together. Gloria has been asking for awhile now for me to make her a doll like the ones Claudine Hellmuth makes "Sitting Pretties". I made one 2 years ago for Bonnie, another great friend. Since then when I would see Gloria, she would say "don't forget you're going to make me one of those dolls!" I had a little inspiration while doing my daily "stroll" thru the world of blogs. I visited Kay Ellen's blog, which I do from time to time to see her great decorating tips and eye candy. By the way, she is featured in Artful Blogging's Summer issue...way too go Kay Ellen! In her blog I had came across this full size wooden chair she had put tulle and lace around the seat. BOOM! It hit me I want to do this for Gloria's present. Decorate a little chair for her "sitting pretty" to be posed on. I guess that's why we post so many pictures, because you never know where inspiration will come from. Anyway, here is Gloria "Sitting Pretty" in the background are her three children. A few people at the party want to make one so I guess this will be the August Art Meetup. From one inspiration many more will grow. Check back June 1st to see what I'll be doing on my blog. I'm excited and I think you will be too. Sunday when I went to visit "The Cottage in the Garden". I did mention I did some shopping, right? I want to share with you these lovely ladies I purchased. I was immediately drawn to them because of there 3D quality. Doll like, altered drawing with fabric making up the dresses, vintage.........right down my alley! Sandra of Under the Sun With Me said "not to be creepy" but they reminded her of the ghost ride at Disneyland where the figures in pictures come alive. Well they do kinda come alive with the 3D effect. I just love them. Half the fun of finding a treasure like these is to do some research to find out more about the items, in this case these pictures. Good old internet (what did we ever do without it?). I started searching with a few clues from the pictures. Looking for marks, signatures, names. Seems there is quite a history behind the designer of these collages. The first thing I find out is the paper at the back is a "fashion plate" and the "La Mode Illustree" was quite popular in the 1800's of depicting beautiful victorian women in their clothing in these "fashion plates". From the information I have found I believe these to be reproductions from the 1950's. the earlier ones from 1800's are signed and have some different markings. Still, all and all, these were from almost 60 years ago!!! I am having some problems differentiating Leroy (I believe the illustrator) from "imp Paris". Paris I get...not sure what "imp" is. La Mode Illustrée was first published in 1859 in Paris and of course was in French. It is difficult to find out much about the actual publishing history of the French magazine itself, although Dover reproduction books of La Mode Illustrée are well documented and available on almost every costume website. La Mode Illustrée was one of the most important French magazines of the late C19th that carried on well into the twentieth century. Wow! kinda interesting huh? Well at least I think so. I guess that's why I am drawn to thrifting and vintage shopping. I like to think of the story behind each item and where it came from and how it got there. These pictures are framed in a chalkware type frame. There are some chips and knicks that I want to fix. Well, that's a whole other investigation and post. So off I go..........have a great day! I attended a Garden Party...You Should Too! A lovely Sunday afternoon, some friends, a glass of ice tea and SHOPPING!!! What could be better? Sandra of Under the Sun With Me had posted on her blog about a monthly garden sale the third weekend of each month. So I decided it would be nice to go check it out and get to see Sandra again and chat. What a lovely venue. Shirley and her husband Jerry own this little cottage with a gated garden/yard calling their venture, The Cottage in the Garden. Shirley and Sandra decorate her house, yard and little backyard shed with lovely art and vintage findings. A patio table under the tree provides a place of shade and a place to drink tea and talk and laugh. Of course, I did a little shopping, how could I not? I purchased two beautifully framed pictures of victorian women...so hard to describe. I will save for another post. You can check out the pictures below to see just a bit of what I saw. The Cottage in the Garden is at 4596 Louisiana St. and opens each Friday, Saturday and Sunday of the 3rd weekend in the month. Check out Sandra's blog for details in that timeframe. I'll try to post something for the next one as a reminder. I wish I took better pictures, these don't do it justice but you get the idea. So next month when you're looking for something to do in San Diego....a Garden Party might just be the ticket. Another wonderful weekend. Flowers are like my friends..... bright and inspirational. I am so lucky (maybe smart ;) to have surrounded myself with good friends that are creative and supportive. Thursday I enjoyed a day of instruction and painting at Jane's. We always have to take a tour of Jane's place to see any new purchases and new art she has created. There is always something new to make us happy. Then she proceeded to show us a few great tips on creating collages and adding a figure to it. Let's just say maybe it's not my "thing" but it was fun and I did learn some tips that I can use in my art. Check out her blog to see what she made that day! Friday I went to Whole Foods and got lunch and picked up my friend of many, many years, June. She is retiring from UCSD this month and has been planning her retirement party for a year now :} I am helping her and we wanted one last meeting to check out the location and last minute things to do. I can hardly wait until she is free to "play" on weekdays. Saturday I went to class at Pink Pineapple. The class was led by Melanie and we made these adorable flowers. So creative and fun. Flowers like friends are sweet, bright and ALWAYS make me happy. Bottle Art, Birthdays and Creativity! Yesterday had the ladies over to create so you need to check out "my other blog" like one isn't enough to keep up. We also celebrated a birthday! So click on over to http://www.artmeetup.blogspot.com and check what was happening! I had made a date to meetup with Bonnie P. since I hadn't seen her for awhile now. She didn't get to art meetup last month and she flying out for her daughter's graduation next art meetup so we decided do some shopping and lunch. I have never been to Anthropologies (I know, how could I have waited this long?) so we agreed to meet there and have some fun. OOOOh what beautiful vignettes they have to display their goods. I had sooo much fun snapping pictures and window shopping. We also hit Barnes & Nobles for our new Somerset Life Magazine with a great article on La Maison Rustique and lovely eye candy. Can't wait to snuggle in and read the magazine and take it all in. We hit Paper, Paper? Lovely papers and you know those gag gifts like Husband Remote Control, funny altoid tins, etc. They had those so it was fun reading and laughing over those things. So we parted ways and I was so happy to have time with Bonnie and hear all about her busy life. Thanks for the fun day Bonnie! I continued down the Highway and remembered that Mel and Gloria had talked about a place in Solano Beach called Bon Bons so I decided to take a short cut (ha) off the freeway and stop in for a quick look. I was not disappointed. Beautiful vintage furniture and "comment vous dites" (how you say) kitschy things. Check out some of the pictures. Lots of religious statues, shells, iron and more. I only have a little time so I told them "I'll be back". Check it out if you're in town. Then you can go on down into the Cedros area...more beautiful eye candy.